Combined the seasoning in a small bowl and mix well. 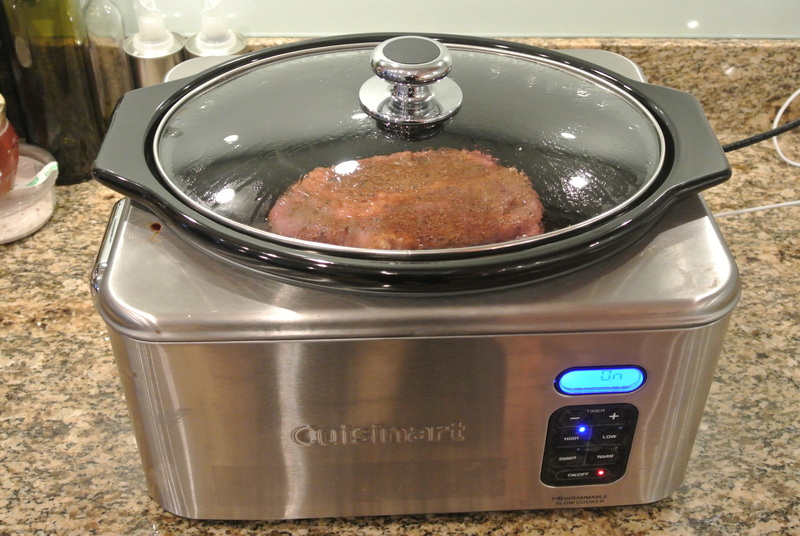 Cover all sides of the chuck roast with the seasonings and place in the slow cooker. Pour the beef broth over the roast and close the lid. Cook on HIGH for about 4-5 hours, flipping the roast at the 2-3 hour mark. About an hour before the beef is cooked, start making the sauce. In a medium saucepan, heat oil and flour together- mixing together for about a minute. Then add the Enchilada or red sauce, hot sauce, beef broth, cilantro, cumin and salt/pepper to your liking. Simmer for about 30-45 minutes. While the sauce is simmering, start softening your corn tortillas! Add a dollop of canola oil to a hot pan (medium heat) and one by one, fry the tortillas until soft…about 30-45 seconds per side. Then place the tortilla on a paper-towel line plate. Repeat. When the beef is done cooking, remove it from the slow cooker and shred. Then get ready to assemble! 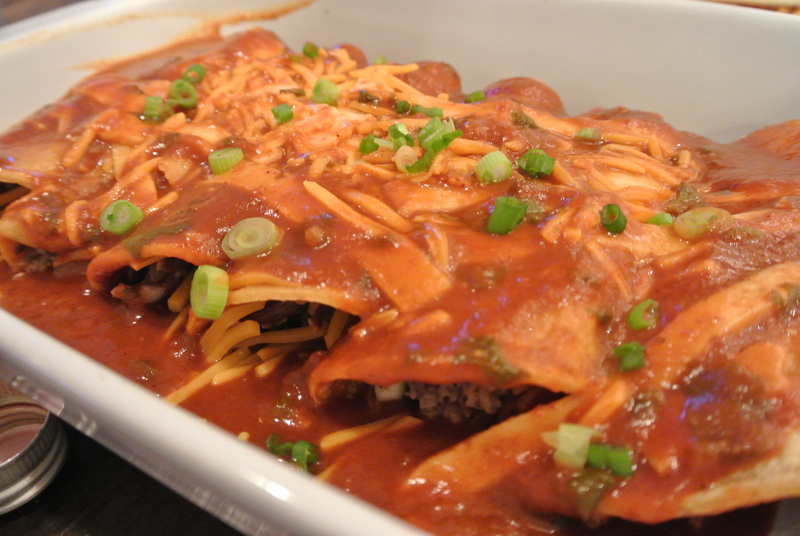 In a baking pan, pour enough of the sauce to cover the bottom. Dip one side of a tortilla in the red sauce and then place it on a work surface- sauce side up. 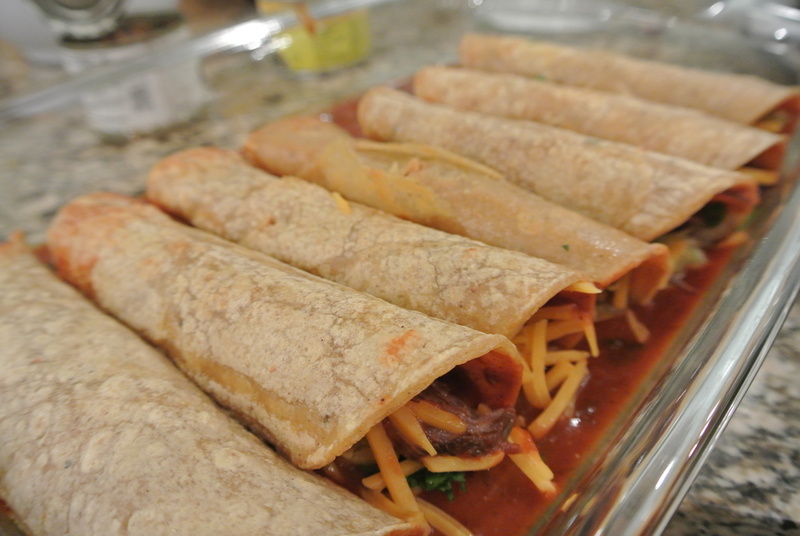 Spoon the beef, chilies, cilantro, black olives and cheddar cheese on the tortilla and roll. Place it in your baking dish and repeat this step until the baking dish is full. 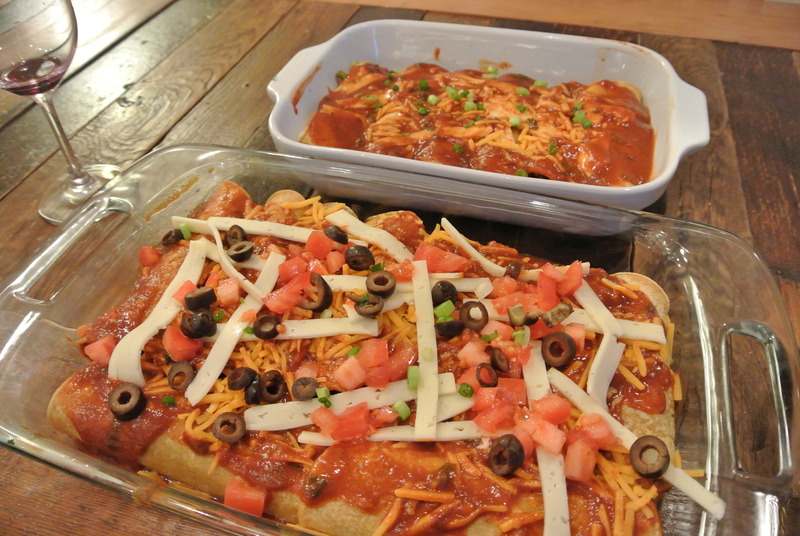 Pour the remaining sauce over the enchiladas and sprinkle the cheese on top along with any leftover olives, green onions and cilantro. Add the tomatoes as well. Bake on 375 degrees for about 20 minutes and then let rest for 5 minutes before serving. These go great on top of shredded lettuce and red cabbage with a little bit of sour cream and guacamole. Also, feel free to add more hot sauce!